A classic example of Indian Sculpture and art. Tala is a village in Chhattisgarh state. As far as sculptural tourism and archaeological importance is concerned, the sculpture art of Tala is par excellence. Its umatched beauty attracts many a travellers to Chhattisgarh. Tala is famous for its two temples called Devrani and Jethani. It is around 29 km's south of Bilaspur. A classic example of Indian Sculpture and art, these temples, located within a single complex and situated side-by-side, owe their names to their dimensions. The larger one was christened Jethani (elder sister-in-law) by the villagers while the smaller one came to be known Devrani or the younger sister-in-law. Thus, the naming of the temples is unique in itself. Famous as Shiva Temples, these are situated on the banks of the river Maniyari. 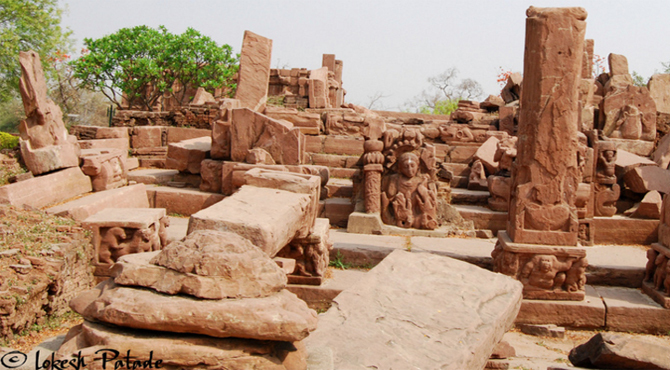 According to the archeologists, the Jethani and Devrani temple were built way back in the fifth century. Declared as protected monuments by the Government in 1984, the famous excavations at the Devrani Temple during the year 1987 - 88 have revealed an extremely unique sculpture of Lord shiva. Today the Jethani temple is in a dilapidated state and only the exquisitely sculpted idols of the temple remain. The Devrani temple is better preserved, stands erect and tall as an example of the rich religious traditions of India. These temples has a variety of sculptures including different gods and goddess of Hindu pantheon, Demi gods, animals, mythical figures, with floral depictions and a variety of geometrical and non geometrical motifs. Jethani Temple faces south direction. Although, partially exposed, the ground plan of the temple is clearly visible. The base of the Jethani Temple has a beautiful Chandrashila at the entrance. The temple consists of the Garbha Griha, the Ardha Mandapa, and the Antraal. It's entrance is from three sides i.e., south, east and west. The main entrance of the temple could be approached through a wide flight of steps. The temple is constructed with layered red-sandstone. The steps leading to the temple has Decorative pillars. Lord Shiva's Yakshagana and Bharvahak Gana designs carved onto them. The base part of the pillar is designed with kumbhas while the top of the pillar consists of Amalaka resting upon a vase. Huge elephant statues guard the sides of the internal chambers, adding more royalty to the mystic ambience. Devrani temple faces the east direction, has no important inscriptions as such in the temple. Names of two brothers Hetukarana and Brahamakarana, probably pilgrims, are engraved on the first step and similar names are found behind the dwarapala image. Devrani temple consists of garbhagriha, antarala, mukha-mandapa and open space approached by a flight of steps with a large chandra shila. The mukhamandapa has a beautiful doorway, depicting river goddess.The doorway leading inside the shrine has five intricately patterned rectangular borders. The doors of the inner chamber are artistically carved with flowering creepers. There are several sculptures Shiva and Parvati which are broken in parts. Sanctum part is much damaged. This complex has a massive sculpture Rudra Shiva. It is a monolithic gigantic sculpture of 2.70 metres height in standing posture. It has unusual iconographic features depicting various animals along with human and lion heads as body components. A turban is made of a pair of snakes. The idol is decorated with snake motifs. Among other animals peacock is depicted as ornamenting ears. Eye brows and nose are made of lizards. Chin is shaped like a Crab. Both the shoulders have depiction of crocodiles. Seven human heads are engraved in various parts of the body. Because of the unusual depiction mentioned above, identification of this sculpture is still a matter of debate among the scholars.